Grocery stores do not typically carry green tomatoes. Purple, yellow, orange heirloom tomatoes, yes; tart green ones, perfect for making faux tomatillo sauce or fried green tomatoes, no. 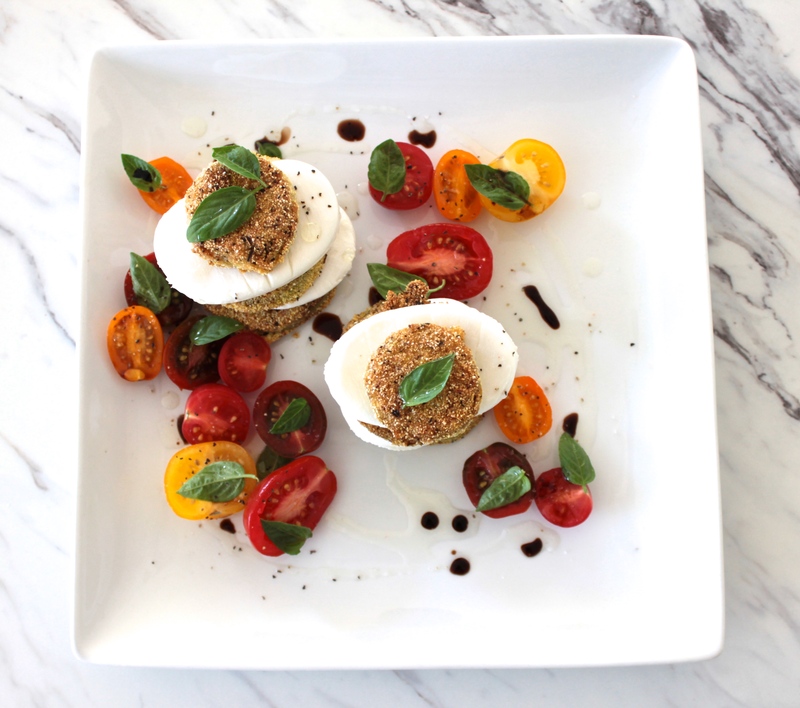 Last summer I thought I’d try a fried green tomato caprese salad, and it was really, really fun. Breaded and pan-fried crispy tart green tomatoes, fresh mozzarella, basil and sweet basalmic vinegar–it was a caprese salad 2.0. This summer we moved. We don’t have a garden yet. We don’t have a yard, yet. We have plans, though–really big, gorgeous garden arbor, raised beds, garden wall, natural blackberry and raspberry fence plans. I can see it, and it’s going to be really great. 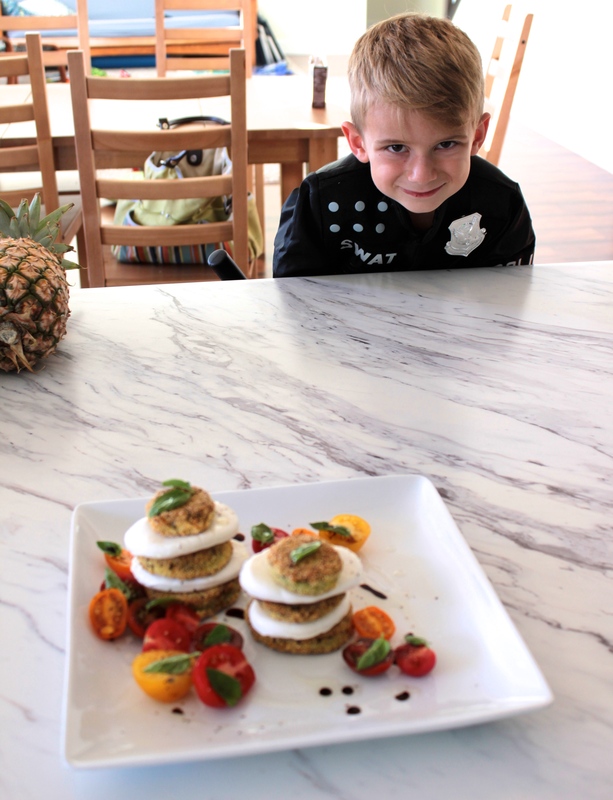 But right now, in the thick of summer, I really wanted to make that fried green tomato caprese salad…so I asked some new friends if they would loan me some green tomatoes. Ok, more like give me to have and devour green tomatoes. I luckily had some willing green-tomato givers. When I pan-fry something, I always use panko breadcrumbs; I think the results are crispier. But when I reached for my panko container, it was totally empty. Rats. So I made do with what I had (and the more traditional southern pan-fry coating): cornmeal. I decided to mix cornmeal and flour, to help the cornmeal not be a burned-too-crunchy-cornmeal texture, and they turned out great. You can make this salad as big or as little as you would like. If your green tomatoes are large, I would estimate one tomato per person; if they are small, two per person. Heat 2-4 tablespoons of olive oil in a large frying pan. Dab both sides of the green tomato slices dry with a paper towel. Working with 3-4 slices at a time, first coat both sides of a slice with flour, then move to the egg bowl and coat both sides, then move to the flour/cornmeal mixture and coat both sides. Gently place in the frying pan. You should be able to comfortably fit 3-4 slices at a time. Watch until they are golden brown and flip. Once they are browned on both sides, let them rest on a cooling rack. They will stay crispier on the rack vs. just laying them on a paper towel or a plate. Continue until all your green tomatoes are fried. 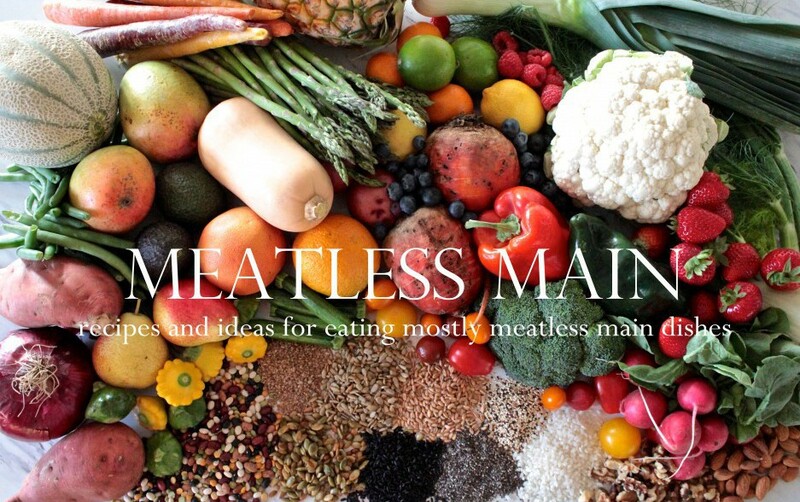 Arrange your salad however you would like! 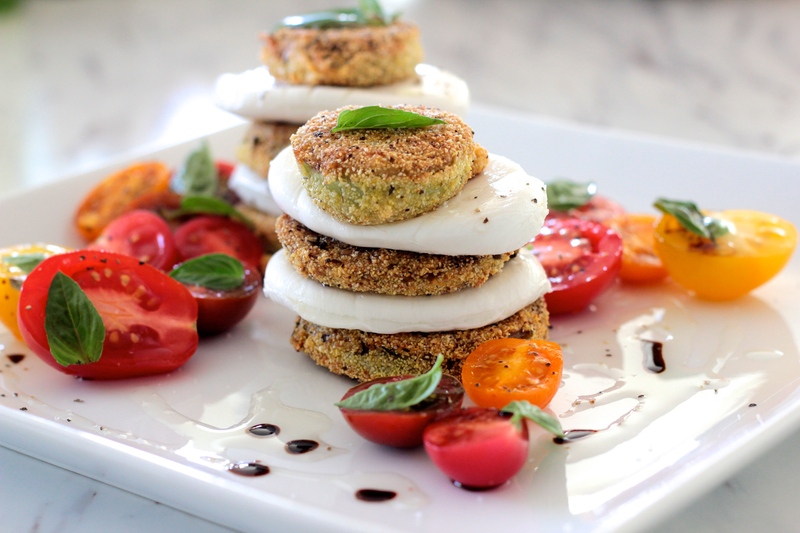 You can make fun towers alternating fried green tomatoes, red tomatoes, and fresh mozzarella; just layer the fried green tomatoes and mozzarella, and cluster the mini tomatoes on the plate, etc. Sprinkle the fresh basil over top and drizzle with olive oil and balsamic vinegar. You can also sprinkle more salt and pepper, if desired.